This sculpted tile depicts an Angel pouring water over the uplifted paw of an ancient mythological creature known as a Griffin (or Gryphon). This sculpted tile depicts 2 angels pouring water into small offering bowls, with a large decorative urn between them. 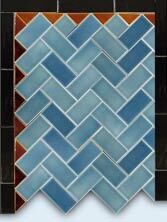 This beautiful handmade tile is produced in the style of the Victorian era. This tile depicts a baby riding a stork - it is a reproduction of a tile from the collection of the JG Low Art Tile Company. 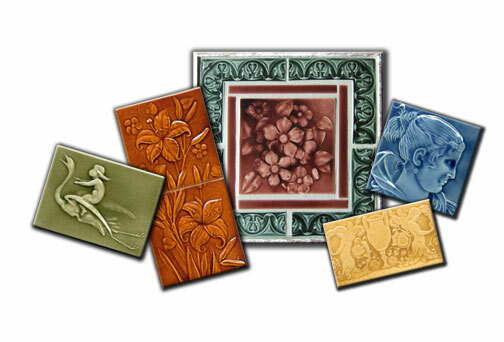 This tile depicts a baby riding a stork - it is a reproduction of a tile from the collection of the JG Low Art Tile Company. Framed in a beautiful hand-made white oak frame, this heirloom piece is truly special.